If ever there were a person who knew how to bounce back from adversity, it would be Newport, RI’s Robie Pierce. At the 1982 Miami Boat Show, while working for the newly formed J Boats, Robie was moving a J/24 around the parking lot when the mast struck an overhead electrical wire. Robie was electrocuted, but survived. How did he deal with this? He named his J/24 Full Charge, complete with lightning bolts for graphics. 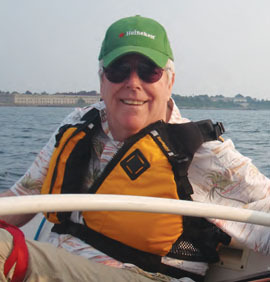 Robie grew up sailing at the Beverly Yacht Club in Marion, MA where he raced a series of boats called American Pie and won most everything there was to win at his club and on Buzzards Bay. At Christmas of 1985, Robie was diagnosed with MS, and has been in a wheelchair ever since. Once again, that adversity thing. Now Robie had a new cause, sailors with disabilities who were the forgotten people on the sailing landscape. Being recognized as a group was only the beginning. In 1990, US Sailing held the first-ever championship for sailors with disabilities — The US Independence and North American Challenge Cups, now known as the US Disabled Sailing Championships. Robie was kind enough not to win the first event; he left that to Larchmont Yacht Club’s Carl Olsson. He did however win it in 1991, and again in 1993 and 1995. But disabled sailors needed to be recognized on a world stage. After having made certain that US Sailing was the RNA (Recognized National Authority) for the sport, rather than Disabled Sports/USA, he made it his goal to make sailing a recognized sport in the Paralympics. While Ian Harrison of Great Britain was the spearhead for the Paralympics, he would not likely have succeeded without the help of Robie, Hugh Elliot and the late Gay Lynn (whose husband Bill was a past President of US Sailing). Working tirelessly, sailing became a demonstration sport at the 1996 Paralympics in Atlanta and was recognized as a medal sport in Sydney in 2000. As if Robie didn’t have enough to do, during the 1990s he was an integral part of Newport-based Shake-A-Leg. It was founded by Rob’s friend, Harry Horgan, after Harry was paralyzed following an automobile accident. It was founded to help disabled people to engage in their mental and physical recovery from an accident or after being diagnosed with a disabling injury. It was a place where people of all abilities could break down previously impervious barriers. Robie meanwhile continued to clean house in the world of disabled sailing. He won the World Disabled Sailing Championship in 1993, followed by the Japan Match Race Cup in 1994. With Robie’s persistence, the U.S. played host to the Disabled World Championships for the first time in 1998 in Newport, RI, and not surprisingly he was a moving force in making it an overwhelming success. The culmination of Robie’s bringing recognition to the world of sailors with disabilities was being awarded the Gay S. Lynn Memorial Trophy in 2004 for “a person, volunteer or professional, or an organization, that is selected by the Council for Sailors with Disabilities, as having made an outstanding contribution to disabled sailors and the sport of disabled sailing over a sustained period of time.” Fittingly, he was the first individual to receive the award. Today Rob, known by friends as Magoo, the Swamp Yankee or the Mayor of Newport, is happily ensconced in Newport, where he is married to Barbara, aka Big Bad Barbara from Boca or Mrs. Big Pants. While not actively sailing anymore, Rob has anything but disappeared from the sailing scene. In 2009, a group of his friends started a new regatta for disabled sailors with all boats supplied. Looking for a name, it was logical it be named after Robie. When called for permission to use his name, he responded with a typical Pierce retort—“but I’m not dead.” Once permission was granted to use his name, he bombarded the organizers with alternate names for the regatta, all featuring his name. Fortunately the organizers ignored him, and it is simply called the Robie Pierce One-Design Regatta. Run jointly by American and Larchmont Yacht Clubs, with the host venue alternating each year, the regatta has grown to be the largest regatta for disabled sailors in one class in the U.S. This year’s event will be held at Larchmont June 1-3 and information is available on the website at robiepierceonedesignregatta.com. In 2011, the regatta evolved by adding the Robie Pierce Women’s Invitational Regatta. This was another Pierce landmark, as the event was the first-ever disabled event created purely for women in the world. This year’s regatta will also be at Larchmont on May 31 and information can be obtained at the Robie website listed above. But typical of Rob, he never rests on his laurels. Even as this is being written, Rob has taken it upon himself to recreate a new logo for the event. As with the event name, he is being thankfully ignored. As you read this article, know that Robie is reading it for the first time as well. If we had consulted him ahead of time, he would have tried to rewrite it. Sorry Magoo.